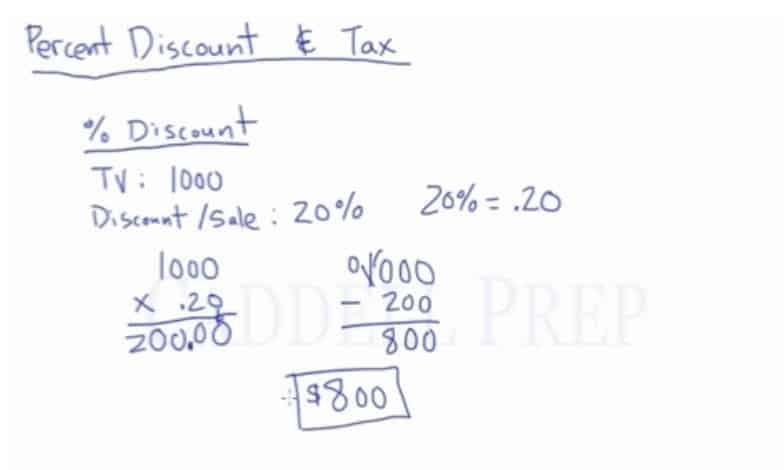 In this lesson, we will discuss percent discount and tax. 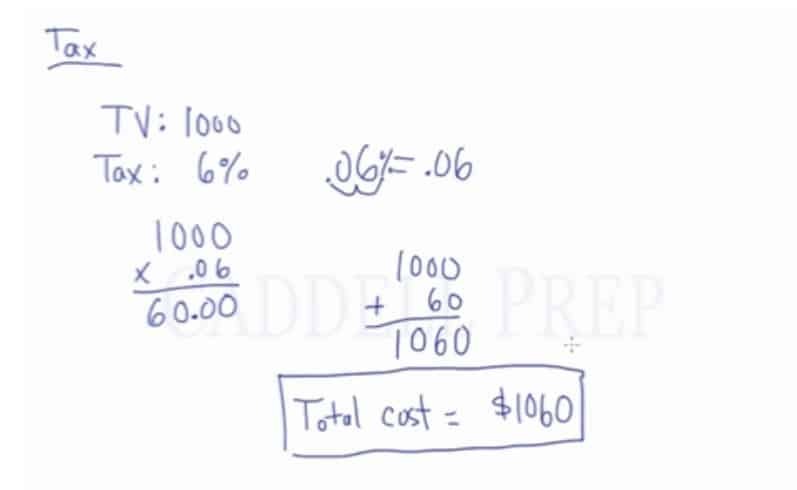 First, let’s discuss percent discount. Percent discount is how much you’re going to receive off of a price. For example, a TV had an original price of which was put on sale at . Some are confused with . This is not a value, it’s a ratio or a fraction. So here we should find out what is of then subtract that. is the discount. This is what we should take off of the price. In the example, since the TV was originally priced at , we should subtract the discount of . The discounted price of the TV is . Again, the is not the actual price. We should find out what is of then subtract it from the original price of to get the discounted price. Now, let’s move on to tax. Tax is added to a price. For example, a different TV is priced at with a tax of . So we have to find out what is of . Then add it to get the final price. So now the final price is computed as the original price of the TV plus the tax. The total cost is . So for tax, find the amount then add it on the original price. Let’s have more complicated problems involving discount and tax. 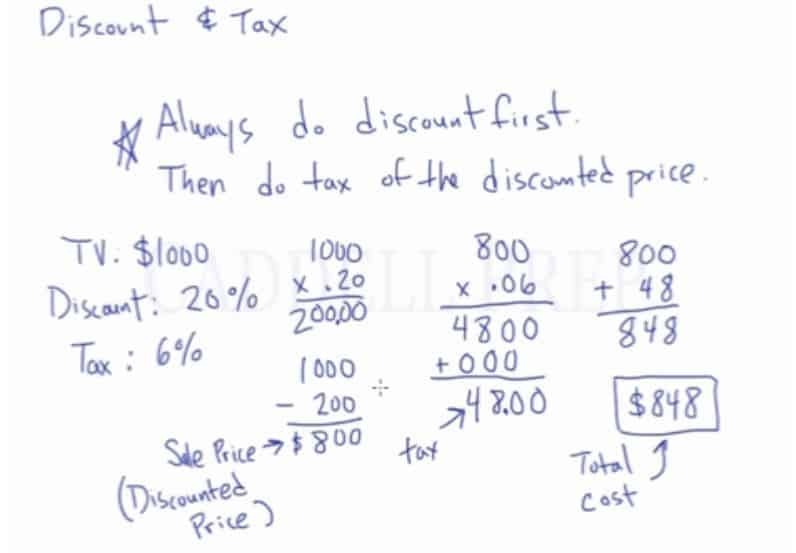 Always do discount first then do tax of the discounted price. For example, we have a TV priced at , discounted for and should be taxed at . To compute, let’s get the discount first. The is the sale price/discounted price. So to get the final price we have to add the discounted price to the tax. We have a TV priced at , discounted for and should be taxed at . We got the discount of which was subtracted to the original price of , the answer is . is the price we’re paying for the TV. The same price we’re going to use to get the tax. The tax was computed by multiplied by the tax where we got the tax of . So the total cost is computed by for the TV plus the tax of . So the total cost of the TV is .